Dallas Harley-Davidson®, located in Garland, TX, is excited to be your place to experience the awesome, new Milwaukee-Eight™ engine! Harley® went all-out for 2017, bringing a whole new level of power to the most responsive, and most comfortable Touring bikes ever. Dallas Harley-Davidson® is a premier place to get your 2017 Harley-Davidson® Milwaukee-Eight™ powered Touring motorcycles. 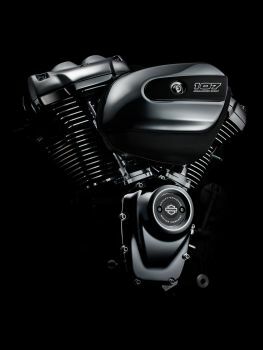 The Milwaukee-Eight™ is an exciting new development in the history of Harley-Davidson, but this engine is only the next step in a long legacy of excellence. The first Harley-Davidson® production V-Twins hit the road in the early 1900s. These F-Head motors inspired the Flathead engine that carried the company through to 1936, when the Knucklehead motor revolutionized air cooled engine design. Touring bikes finally got their first dedicated engine in the Shovelhead that emerged in the mid-sixties, giving way to the Evolution engines of the 1980s, and eventually the Twin Cam motor at the turn of the millennium. Now the next era of Harley-Davidson® V-Twin power is here, and the Milwaukee-Eight™ is ready to run with the long history of excellence that has been over a century in the making! The Milwaukee-Eight™ is loaded with plenty of power. This heavy hitting engine delivers a boost that you can feel when compared to the Twin Cam engines it replaces. The Milwaukee-Eight™ has plenty of pull right off the line, and once you hit the road you’ve always got more power on tap. This engine has a superior power to weight ratio compared to the Twin Cam engine, allowing the Milwaukee-Eight™ to get a full 10% improvement in terms of available power, which means this engine is able to produce up to 111 ft. lbs of torque. Part of the power comes from the increased size of the engine, clocking in at a formidable 107 cubic inches on stock 2017 touring motorcycles. If the 107 Milwaukee-Eight™ isn’t enough V-twin for you, then you can check out the available CVO® touring bikes which come equipped with a 114 cubic inch Milwaukee-Eight™ engine. Still needing some more oomph on your motorcycle? Outfit your stock Milwaukee-Eight™ engine with a Screamin’ Eagle™ Stage III upgrade kit and boost the engine to a massive 117 cubic inches, and then hold on tight! All that power, and the Milwaukee-Eight™ still delivers performance to match! The Milwaukee-Eight™ isn’t just more powerful than the Twin Cam, it runs cooler, smoother, and more efficiently as well! The Milwaukee-Eight™’s precision cooling targets the hottest components of the engine to draw heat away, resulting in a cooler ride that you’re sure to notice even when you’re at low speeds. The rubber mounting of the Milwaukee-Eight™ helps to even out the vibration of your bike at idle, and when you hit highway speeds you’ll feel the difference as the counterbalancer delivers fluid performance all the way up to the redline. Thanks to the eight valve design and the precise electronic fuel injection, the Milwaukee-Eight™ also delivers better fuel economy, and lower emissions. Dallas Harley-Davidson® is thrilled to be your home for the all-new Milwaukee-Eight™ engine. Our dealership is conveniently located in Garland, TX, near the areas of Dallas, Rockwall, Forney, Mesquite, and Richardson. Stop by today, sign-up to test ride a new 2017 Harley-Davidson® Touring Motorcycle, or learn more about the other 2017 Harley® engines, suspension, and performance upgrades available now!